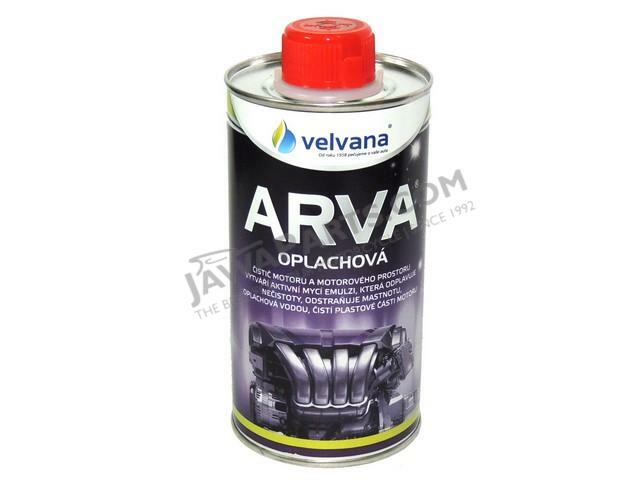 ARVA® is an active cleaning agent for cleaning and degreasing a variety of metal objects in car repair shops, fleet maintenance depots and workshop and service areas. Cleaning with the Rinse-Off product removes greasy dirt from the surfaces of engines, engine compartments and the undersides of all types of vehicles and construction, cargo and agricultural machinery. It also cleans the plastic parts of engines. ARVA® is also a solution for cleaning oil impurities from different components of workshop equipment, workshop floors, garages and parking places. ARVA ® creates a strong-acting emulsion that binds dirt and flushes it away. ARVA® should be rinsed off with water. Spray the product on heavily soiled surfaces, let it work for 5 - 10 minutes and thoroughly rinse off with water in accordance with the degree of pollution. Prior to using ARVA cover all electrical parts to prevent the infiltration of water during rinsing. It is used in its original condition, undiluted. Before use shake the product that is in small packages. Fields of application: Car, motorcycle and bike servicing.